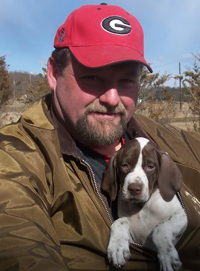 Steve Anker, A.K.A "Hoss", has been training dogs since 1995, specializing in Pointing Breeds. Having his heart and soul into Field Trialing, he trained and trialed the AKC #1 Open Limited Gun Dog 2006-2007, Pointer FC FEATHER TERRORS GRITZ-N-GRAVY. While Steve's passion lies in Horseback Trialing, he is responsible for many AKC Master Hunters, as well as a trip to the NAVHDA VERSATILE CHAMPIONSHIP. He is active in the Hudson Valley Chapter of NAVHDA as well as the Long Island GSP Club and other Clubs in the area. Being involved with all these venues keeps his manners clean and his knowledge and experiences very broad.